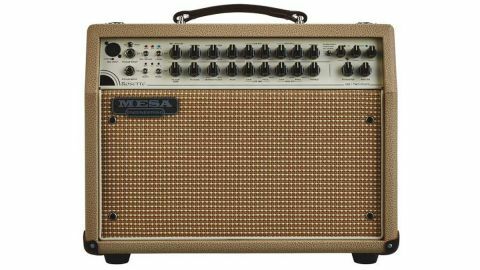 Mesa’s first foray into the acoustic world is a lot of money for an amp, but is it a lot of amp for the money? This is a really great-sounding amp; take it anywhere, it will not let you down. Expensive, and enough features to become confusing. Randall Smith’s Mesa/Boogie is often referred to as the first boutique amplifier company; since 1971 at least part of his time was spent on amplification; initially molding Fender Princeton amps for higher gain, and later, its own high gain amps. These have reached legendary status, but those saturated high gain tones are the opposite of the completely transparent clean tones we look for in an acoustic amp. Whether Mesa’s high-end audio expertise can make that transition is a question that can only be answered by trying this very fine-looking amp out. And fine-looking it certainly is; we’ve never owned a cream-coloured amp, so we can’t speak to how it will respond to five years of pub abuse, but out of the box, it’s very handsome. The styling nods to Mesa/Boogie amps from the electric guitar world, but at the same time, looks like a classy acoustic amp. We have a simple cream, tolex enclosure, protected on the bottom and rear top corners with real leather reinforcements, and with a slant to the front instrument panel which, at least for this very tall reviewer, isn’t enough to make the controls easily visible. Below the slant, the grille covers two 8” speakers, and on the top, there’s a solid leather strap that feels both secure and luxurious. That front panel is a forest of controls, 23 knobs, six mini toggles, and 11 LEDs make for a display that’s either impressive and intriguing or imposing, depending on your preference for complexity. To us, it looks like a playground, and we want to play. Additionally, the Acoustic Rosette comes with one of the most comprehensive and verbose manuals we have ever seen; Mesa Engineering put a lot of time and thought into this amp, and it would like to be sure you know it. What’s on offer on the front panel looks standard; there are two channels, one with a jack and an XLR, and one with a jack only. A clue to what’s different is the mini toggle to switch between the inputs on channel 1; normally this isn’t necessary as they both go to the same preamp, but Mesa have equipped this unit with a specifically designed mic preamp for extra low noise, compared to a dual purpose preamp. There are mute switches, which mute all outputs for either channel, so you can use an inline tuner safe from having your efforts heard by anyone else. Both channels have a phase switch, which produces noticeable changes in tone, and can help reduce feedback problems. Inputs aside, both channels are identical; there’s a gain control and a four-band EQ (sweepable high and low mids let you select exactly which frequencies to boost or cut) for each. The FX send controls how much of the post-gain signal goes to the internal FX unit (or to the external FX loop, which deactivates the internal unit). There is a single FX master control, which means that FX level for each channel rises with gain, or can be raised or lowered independently per channel, and/or raised and lowered in the total mix for both channels. Hi-Pass filters help control the pervasive low frequency feedback that plagues amplified acoustic instruments. The internal FX processor has room and hall reverbs, and a chorus plus room reverb. There are three parameter controls, which in the reverbs control reverb time, hi cut and lo cut filters, or with the combined effect, the amount of chorus and reverb, and the chorus rate. The FX master and master volume at the extreme right end allow control over the main mix, which can be useful for making large scale adjustments during performance (turn it up mate! Too much reverb!). The back panel is similarly busy; there’s a speaker output (of course this is a combo, and there is a cable hardwired to the speaker cabinet that’s generally plugged in here, but you can plug into something else, should you want for example 12” speakers for greater bass response. There’s a headphone jack, which does not mute the main output (you have to unplug the speaker for that), which means that you can practise as silently as an acoustic guitar will allow, but also that you could monitor straight from the amp into headphones on a noisy stage. There are jacks for two footswitches; you can mute either or both channels with one, whilst the other toggles the FX loop in or out. Then there are FX send and return sockets, and the row of ¼” jacks is completed by an aux in, so you can connect devices to play background music (or any other audio source your mind might invent). A nice differentiating feature is the DI outputs; which give you balance XLR outs for each channel and a summed overall output taken post EQ and FX. This means you can use your amp as a stage monitor, and go straight into the desk to get the same tone through the front of house. Even these outputs have a myriad of switching options; all three have a mini toggle between mic and line level outputs, a second for ground lift (in case of earth hum), and the individual channel outputs can be switched between pre and post EQ (they are always pre FX, only the summed output includes FX). In short, it’s hard to imagine a more comprehensively equipped amplifier. Perhaps this level of complexity is needed to justify such a high price, but to truly live up to it, it needs to sound great. Long story short; it does sound great. Despite all the configurability, this is intended to be a “set and forget” type of unit; you tweak it til your guitar sounds like your guitar, and then try to never touch it again. Plugging in for the first time, it’s worth knowing that 300 watts is a lot, and if you’re in a small venue, or your front room, really start with the gain and master low, because it’ll get painful at lower numbers than you might expect. Starting with the EQ set flat, we immediately got something very close to our guitar’s acoustic tone. Truthfully, all but the very cheapest acoustic amps we’ve tried have managed that, but the Mesa genuinely required even less tweaking than usual to get us where we wanted to be, and was very quiet to boot. Having got our guitar sounding right, we then started to push the volume to see how feedback resistant it was; about typical was the answer, but we had more options for taming that hum than we’d normally have (no notch filter though, notably), and we were able to make things pretty uncomfortable in the room where we were testing while still keeping things under control. The FX are excellent, subtle and useable, and we really had no trouble getting a natural sounding tone we were happy with. Rather than test the mic channel with a dynamic vocal mic, we plugged in my large diaphragm condenser, and tried several guitars against that. The clarity and crispness was excellent, and whilst the feedback resistance is impaired, we could get plenty of volume for most of the places we might use it. We even felt that my duo could work with a single mic and this amp in small venues. Is the Acoustic Rosette good? Yes; it’s very, very good, and it equips you for every occasion, including ones we’ve never experienced. Is it worth the £1,300 odd price? That’s a value judgement only you can make, but we would say it’s probably the best acoustic amp we’ve tried. High price, but high praise.